But whoever looks intently into the perfect law that gives freedom, and continues in it-not forgetting what they have heard, but doing it–they will be blessed in what they do. There’s a similar vibe to the Matthew 7:3 type of verses to James 1:25 – Why do you look at the speck of sawdust in your brother’s eye and pay no attention to the plank in your own eye? [Matthew 7:3|Article]. Well, not exactly, because there’s a difference between doing what’s bad and not doing what’s good. Yet I feel it is similar enough to be discussed along the same wavelength – these are verses that tells us to check ourselves. Check our own hearts. Check our own minds. In this study we will examine this verse in its entirety and list out the three steps for us to check ourselves against the word. The 3 steps: Firstly, to look intently into the perfect law. Secondly, to keep it in mind and never forget it. Thirdly, to continue doing it. Lets look at them bit by bit. But whoever looks intently into the perfect law that gives freedom – You’ve got to love the way James wrote this couple of verses. Let me quote you the preceding few verses – Do not merely listen to the word, and so deceive yourselves. Do what it says. Anyone who listens to the word but does not do what it says is like someone who looks at his face in a mirror and, after looking at himself, goes away and immediately forgets what he looks like [James 1:22-24]. It’s pretty much in the same wavelength as Matthew 7:3. James follows up with – But whoever – Instead of looking at yourself and forgetting what you’ve seen, a righteous man would look instead into the perfect law, and remember what he has seen. The term look in verse 25 really doesn’t just mean look, but also to study, also to understand, also to memorize and to use the perfect law as a guide line. That’s probably why there was the adverb, ‘intently‘. and continues in it-not forgetting what they have heard – I’ve never seen anyone with a perfect memory. Never. Maybe such people exists. I haven’t ever met even a 0.000000001 % of all the people in the world to be able to confidently say that I believe that such people do not exists, but I dare confidently say that I believe that most people have limited memories. It is human nature to forget about things. It is human nature to prioritize the important things and remember the things you care about. It comes naturally, after all, if it’s something important, you may worry about it. If it’s something you care about, you may keep thinking about it. And if you constantly thinking about something, it’s hard to forget it. That’s what we need to do in regards to the perfect law that grants us freedom, no? Don’t forget it. And how do we help ourselves to remember it? It boils down to how highly we value it. Do we even prioritize it? Do we care about it? Do we think it is important? If we do, our capacity to remember it will come naturally to us. But if we don’t ever make time out to look at it or think about it, we can always ‘try’, but our memory will evade us when it comes to the word. but doing it – Of course, it is one thing to know and understand the word, but it is another matter altogether to obey the word. You do not obey the word the moment you understand the precepts of the Lord. Even if you are enlightened, you are not immediately obedient. Obedience has nothing to do with knowledge, although admittedly, you would certainly need to understand the word in order to obey it, else you may think you’re obeying but you’re not because you’re doing something else entirely. Now that you know these things, you will be blessed if you do them [John 13:17]. 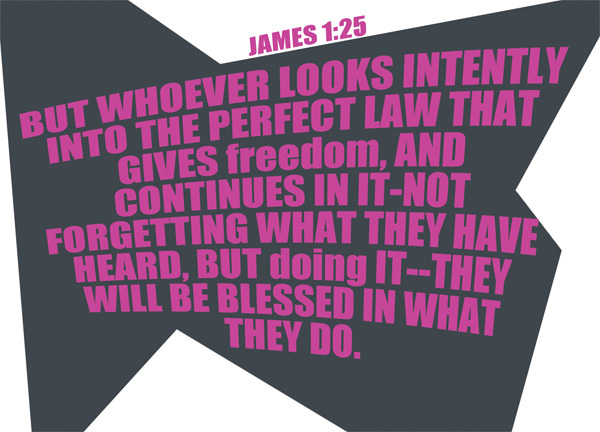 And when James say you will be blessed in what you do, it refers to the perfect law of the Lord. When you continue to do the perfect law of the Lord that grants us freedom, you will be blessed. Heard a story just a couple of days ago: One day, a group of theological students snuck out of College during fasting period and went to a nearby restaurant for lunch. While they were in the middle of a sumptuous meal, a familiar voice asked, “are not all students and faculty supposed to be fasting and praying at this time?” The students turned around and were shocked to see one of their lecturers from the Bible College. While the others were still in shock, one of the students quickly said, “we are fasting!” and while saying that, he peeked over the lecturer’s shoulder to see that there was actually a dish of steak on his table. And so the student asked, “but Sir, what are you doing here?” The lecturer was speechless. I don’t know how true that story is, or where it came from, but I can imagine it happening. It’s not hard – I’m currently planning for a famine camp, where participants go about 30 hours without solid food in order to experience the plight of the poor, the needy, the hungry – and while I cannot say for sure, but the idea of a famine camp was most likely inspired by the idea of fasting – it’s pretty much the same logic. And the thing is, whether lay Christians, teachers of the word, or theological students – whoever you are, fasting is not easy. Whoever you are, a lot of things that are for the good of God’s Kingdom won’t be easy. We often know what we should be doing, as we understand enough about the word of God, but we seldom do what we should be doing. Sometimes when point at others in disgust at what they are doing, but somehow we’re seldom disgusted at what we do not do, perhaps because we don’t look at ourselves. Let us not just be preachers of the word. Let us be doers as well. Look at the word. Remember it. Do it.